Four wins out of four, Jan Kirchhoff completing his first 90 minutes and another promising youngster makes an instant impression. On the face of it, not a bad night’s work for David Moyes and Sunderland after they successfully overcame the strongest opposition to date in pre-season, in Dijon. The already impressive fitness levels were topped up, with Moyes naming a far-stronger side than the one that beat Stade Nyonnais earlier in the week. Teenager Joel Asoro opened the scoring with a clinical finish after showing his instinct to seize on a defensive mistake. The 17-year-old’s performance was a real highlight on another warm night at the Stade Camille-Fournier in Evian. He looks to have a bright future in the game on the evidence of his first start in a red and white shirt. Lamine Kone – a target for Everton and Leicester City – and Younes Kaboul enjoyed another 90 minutes together, honing their central defensive partnership that looked rock solid towards the end of last season. But it was the sight of Kirchhoff’s name on the teamsheet that gave the 400 or so Sunderland fans a big pre-match boost. The giant German had been a worrying omission from the first three games of pre-season – a calf injury keeping him out amid growing concern over his fitness. You wouldn’t have guessed it was his first minutes of the pre-season programme though, with Kirchhoff completing 90 minutes – not often you could say that last season. So, a positive night for Sunderland ahead of their final friendly of this tour on Saturday against Montpellier HSC. Major concerns remain, however, ahead of the new Premier League season. Namely, the lack of new faces in the squad. The thigh injury to Jermain Defoe a timely reminder – as if one was needed – of how threadbare this Sunderland squad is. There is quality but not depth. More of both is needed. Defoe’s injury thankfully shouldn’t prevent him from featuring against Manchester City. But Sunderland MUST have at least one new striker in the door by then – they cannot start the season relying so heavily on the goals of the 33-year-old. Fabio Borini managed to score again last night, while Duncan Watmore netted twice against Nyonnais but the number one priority remains adding extra firepower. Asoro looked promising, a real threat at times, but clearly he is too raw and not ready for the Premier League. New chief executive Martin Bain was again watching from the stands, his phone has been ringing off the hook all week as the club look to ramp up their transfer business. The latest player to be linked is 21-year-old French right-back Frédéric Guilbert. He was first linked with a move to Wearside at the start of the month, with sources in France now claiming a formal offer could arrive soon. Right-back and centre-back are high on the wanted list, but clearly another striker is key. As for the game itself, Dijon won promotion to Ligue 1 last year so were comfortably the highest calibre of team faced by Sunderland so far. Jordan Pickford was named in goal and Asoro up front, but, aside from those two, Moyes went for experience. Jack Rodwell was again named in the starting line-up, but not in central defence this time. Instead he was playing right-back – another timely reminder of the need for a new full-back. There was little to get excited about in the opening stages, with few moments of real quality, though Wahbi Khazri saw a free-kick well saved. The game burst into life 15 minutes in – through 17-year-old Swedish-born forward Asoro. The youngster took advantage of a woeful mistake from Jordan Loties, Asoro bundling him off the ball before slotting coolly past Reywet Baptiste from a tight angle off the post. It was a composed and clinical finish from the teenager, with Defoe applauding him. Dijon offered little threat, twice blasting efforts high over the metal fence behind Pickford’s goal. Kirchhoff, meanwhile, was easing himself back into action, showing little signs of rust as he kept play nice and simple in the centre of midfield. There was a moment of concern towards the end of the half when he needed treatment to what appeared an ankle knock, but he was soon back on his feet as Sunderland went in at the break leading. The second half was a far more lively affair, with Dijon pressing Sunderland back and it wasn’t long before they equalised. Eight minutes in, Dylan Bahamboulia connected well to fire past Pickford from 12-yards out – the England Under-21 international got a hand to it but was unable to make the save. It wasn’t long, though, before Sunderland restored their lead. Livewire Asoro played the ball across to Khazri, who picked his spot low into the left-hand corner of the net, giving Baptiste no chance. Dijon weren’t lying down though and hit back on 69 minutes, Bahamboulia burst into the box down the right before picking out Bela, who showed good feet score as Rodwell slipped. 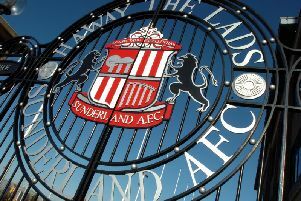 Sunderland’s winning goal came via the penalty spot, sub Watmore won it after his cross hit the hand of a Dijon defender and Borini stepped up to score, clinically firing low to the keeper’s right. Plenty of positives for Moyes to take from the victory, then, but there remains major concerns to ponder too on the banks of Lake Geneva.